Lonach Gathering has the reputation of being Scotlands friendliest Highland Games. Lonach Gathering always takes place on the fourth Saturday in August at Bellabeg Park, Strathdon. Lonach March takes place in the morning before theLonach Games. The Lonach March is a splendid demonstration of Scottish hospitality & friendliness from all the marchers and patrons. The games start just before The March finishes. 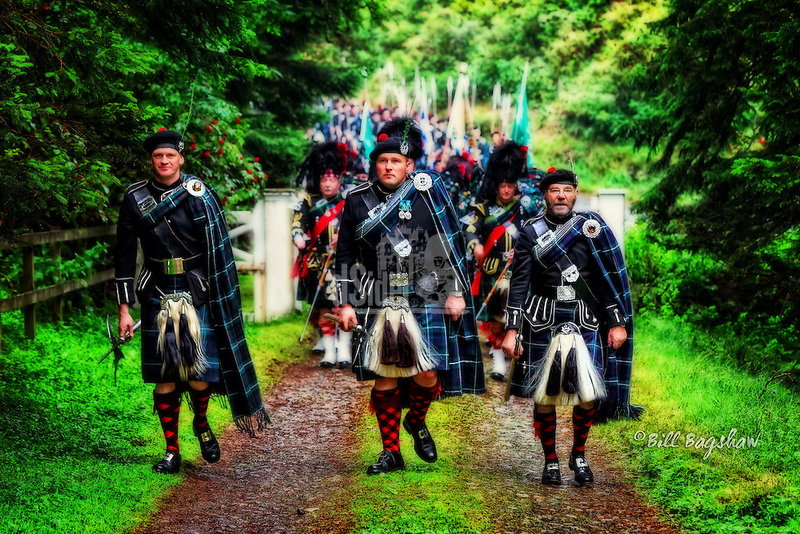 The Lonach Gathering commences with The Lonach March; which starts early in the morning; before The Highland Games. Lonach March features the men of Lonach in full highland dress and with banners flying. Clansmen carry pikes, and call in for a dram of whisky at various patrons during the march. The procession is followed by a horse and cart. The fine tradition of The Loncach Gathering and March has been passed on from generation to generation. The Lonach Gathering is hard to beat for sheer spectacle and is always well attended. The Lonach Gathering patron is Sir James Forbes whose ancestors founded the Lonach Highland & Friendly Society. Sir James is shown in the slideshow donning his feathered cap to commence The March. Lonach Highland & Friendly Society came into being after a great gathering to mark the 21st birthday of John Forbes in 1822. Such a good time was had by all that it was resolved to form The Society. The gathering is held in the village of Bellabeg, Strathdon on the A944. Arrive early to avoid traffic congestion.